Hot Issue – Cortisone – Friend or Foe? CORTISONE – FRIEND OR FOE? Cortisone is one of the most widely used drugs in the world, and also one of those drugs with the worst reputations around. But just what does cortisone do, and why has it got that bad reputation? In actual fact, cortisone has a myriad of good uses and is used by many vets to save the lives of patients that have suffered acute trauma, as well as in the treatment of immune diseases. 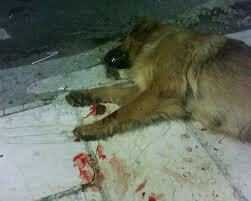 BUT – it is abused, especially in cases where animals itch all the time. A single injection of that good old “Itch shot” will make your pet go from a mad, scratching, red, scabby beast into a calm, happy animal. For a few days, anyway. But, the bad side effects of cortisone are well known by the public, making repeated cortisone injections unhealthy for your pet as well as not solving the problem in the first place. Cortisone is naturally produced by the body in small amounts every day, where it functions as a natural anti inflammatory and painkiller and helps the body to deal with shock and stress. In fact, if you don’t have cortisone in your body, you will die. (see Addison’s disease) It is a steroid type of hormone, but not the same as the steroids that body builders take. It is produced by the adrenal gland, the same gland that produces adrenalin. When an animal is in shock, the blood pressure can drop and lead to poor circulation and accumulation of toxic waste in the tissues, without a strong bloodflow to carry it away. This toxic waste damages the tissues and organs and can lead to death. Cortisone given during shock can help stabilize the blood pressure and allow blood to flow back to the organs and tissues that need it, bringing vital oxygen and nutrients and clearing away the toxic waste. It also helps with the pain associated with trauma. Bad allergies and allergic shock from, for example, a bee sting can be controlled with cortisone injected intravenously. 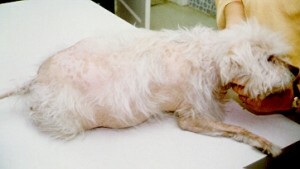 Dogs with heat stroke that cannot breathe often respond well to intravenous cortisone injections as it reduces the swelling of the airways, allowing them to breathe more easily. Allergies – Cortisone is an immunosuppressive drug. 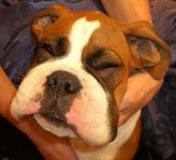 Allergies are the result of an immune system that over reacts to substances in the pet’s environment, such as pollen, house dust mites, certain foods etc. When the body over reacts to substances it is allergic to, it releases chemicals into the skin that cause itching, swelling and redness. Cortisone does not cure the allergy, it merely suppresses the immune system, stopping it over reacting the these substances for a short period. 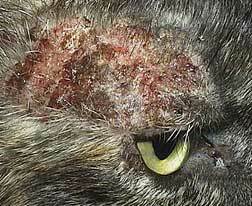 Rodent Ulcers – Rodent ulcers occur on cat’s upper lips and look as if the flesh has been eaten away. The whole lip is thickened in the area. There isn’t a definite cause but the immune system is also hyper active in this case, so cortisone helps to suppress the immune system and allow the ulcers to heal up. 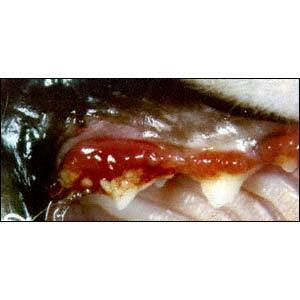 Gingivitis, or gum disease, is seen in both dogs and cats. 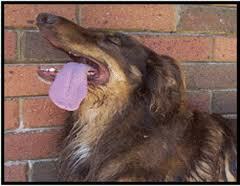 In dogs, it is usually due to tartar and rotten teeth, and often improves substantially with oral hygiene. 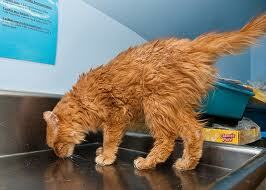 In cats, it can be due to a rotten mouth, but it can also be a condition known as chronic gingivitis. In these cats, the mouth is painful, and they struggle to groom themselves and eat, and they often drool and let out cries of pain when they try to eat. If they allow you to open their very sore mouths, it can be seen that the gums at the back of the mouth round the molar teeth bleed, and are very red. The mouth may also stink horribly. There are a number of causes of gingivitis – poor oral hygiene, infection with viruses such as feline AIDS, Leukaemia, Herpes, Calici and Rhinotracheitis, and a problem with the immune system where the body becomes hypersensitive to the bacteria in the mouth, so the moment plaque begins to form on the teeth, the body reacts violently to the bacteria filled plaque and the gums become red, inflammed and sore. It is in this case that cortisone is used, to suppress the immune system. If the cat is positive for either feline AIDS or Leukaemia, using cortisone is controversial as those diseases cause immunosupression themselves and the cortisone may make it worse, predisposing them to picking up infections. Cortisone isn’t the best treatment for any type of gingivitis, as it has to be used very often to control the disease, and side effects occur at these doses. The best treatment for gingivitis is to remove the teeth, at least where the gums are badly inflamed, but possibly all the teeth in the mouth may need to be removed. Cats with badly infected stinking mouth also do well on antibiotics to control the infection. Immune Mediated Haemoytic Anaemia (IMHA) – This is a serious condition where the body attacks and kills its own red blood cells, making the patient anaemic, weak and many can even die. Patients show weakness, a rapid, pulse and pale gums. With IMHA, the immune system attacks the red blood cells “by mistake.” Normally, when something foreign enters the body, like a virus or bacteria, the immune systems function is to recognize that it is foreign. and attack, kill and get rid of the foreign substance. The body also then “‘remembers” what the foreign substance looks like so if it comes into contact with the same thing again in the future, it can recognize it a lot faster. In IMHA, the body mistakenly attacks it’s own red blood cells, thinking they are foreign, and since the body also keeps producing new red blood cells because of the anaemia, they never get eliminated and so the body keeps on attacking them. Cortisone, being an immunosuppressive drug, can, given in high doses, stop the immune system reacting until, hopefully, the immune system stops attacking the red blood cells. Immune Mediated Thrombocytopaenia – A condition similar to IMHA, but the blood platelets are attacked and not the red blood cells. patients show bruising no the skin, especially on the belly, black stools, internal bleeding, pale gums and weakness. Cortisone, being an immunosuppressive drug, can, given in high doses, stop the immune system reacting until, hopefully, the immune system stops attacking the platelets. Discoid Lupus Erythematosus – A skin disease on the nose and face where the body attacks the skin, making it lose it’s pigment, red, scabby and vulnerable to being burnt in the sun. Cortisone, being an immunosuppressive drug, can, given in high doses, stop the immune system reacting until, hopefully, the immune system stops attacking the skin. Systemic Lupus Erythematosus – A serious condition, in which the body attacks a number of organs at the same time including the joints, kidneys and brain. Cortisone, being an immunosuppressive drug, can, given in high doses, stop the immune system reacting until, hopefully, the immune system stops attacking itself. Pemphigus Complex – A serious immune based skin disease where the body attacks the bottom layer of skin forming blisters where the skin pulls off from its base layer. This is very painful and needs immediate treatment. Cortisone, being an immunosuppressive drug, can, given in high doses, stop the immune system reacting until, hopefully, the immune system stops attacking the base layers of the skin. Rheumatoid Arthritis – A painful immune based arthritis in which the body attacks it’s own joints. Cortisone, being an immunosuppressive drug, can, given in high doses, stop the immune system reacting until, hopefully, the immune system stops attacking the joints. Lymphoma – Lymphoma responds very well to cortisone. Cortisone alone can cause the cancer to go into remission for a short time – about two months in good cases. If used in combination with chemotherapy, the effect can last for a few months and up to or over a year, depending on the stage and type of lymphoma and how well the dog or cat tolerates the drugs. Mastocytoma – Cortisone can decrease the inflammation caused by removal of a mast cell tumour, which may decrease post op problems like wound dehiscence. Chemicals being released from the tumor during surgery which go into the bloodstream may be reduced by using cortisone. Spinal Pain – Spinal pain due to a slipped disc responds very well to cortisone injections. High doses may lead to stomach ulcers forming. Brain Injury or Inflammation – Animals with head trauma, strokes and even small brain tumours respond well to the anti inflammatory effect of cortisone, allowing them to function better and heal, if possible. Long acting cortisone, also known as “depo injections” can last for a few weeks. The depo injections are actually a shorter acting version of cortisone which is released from the injection site slowly over time. These injections are most commonly given for gingivitis and recurring severe allergic skin disease. They are controversial as continuously supplying the body with cortisone, with no control over how soon it can be stopped if there is a problem, can lead to the development of Diabetes, as well as weight gain and immunosuppression. In these patients, the injections are given often because “nothing else works” or because of convenience, in which a owner doesn’t want to have to dose his pet daily for a number of weeks. It is better for the patients to have the teeth removed or do to tests to find the cause of the allergies and treat them properly. than to use this type of injection all the time. 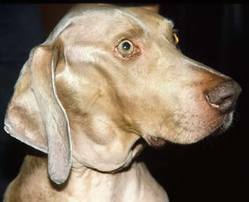 It is recommend that pets do not get more than four of these injections a year, or they might develop health problems. Prednisolone tablets and injections are the most common form of cortisone used in the world. These are the little white “allergy” tablets that your vet routinely dispenses. The effects of Prednisolone last for about a day, so most owners are given a course which starts at a higher dose and then reduces over time to a lower dose then stops. Although they are a lot safer to use daily than dexamethasone, dogs that are on the tablets all the time will develop iatrogenic Cushing’s Disease. Most creams and ear ointments for skin allergies, eczema and ear infections contain shorter acting forms of cortisone that can be applied daily or a few times daily to a pet’s skin to control signs of inflammation and allergies. Owners shoud be aware that some of the cortisone can be absorbed into the body and also affect the health of the pet over the long term if used frequently. 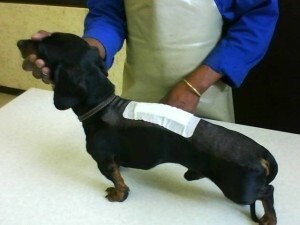 Some injectable forms of cortisone can be short acting, and used to treat shock and trauma at the vet. Eyedrops that contain cortisone should never be used routinely for a sore eye unless your vet has checked there are no scratches or ulcers on the eye. Increase in Blood Sugar – may lead to diabetes with excessive doses of depo forms. In my opinion cortisone is very useful life saving drug, but in many cases is given far too often and readily, especially in skin cases, where working up the source of the allergy would be the better and healthier thing to do. 8 Responses to "Hot Issue – Cortisone – Friend or Foe?" My Alsation is on 10 cortisol tablets a day to help her with this awful auto ammune skin disease…accompanied with the scratching…there are puddles everywhere in the house as these tablets are causing her bladder to give way uncontrolably . I then got tablets to help with that..thing is they are not helping. Does anyone have any ideas what else I can do for her. Her fur is soaking wet most of the day and I am forever washing her…..Bella is 5 years old. My Great Dane has been suffering with what I think may be Wobblers, my vet is great and gave him a shot of Cortisone yesterday because he was lethargic and has been refusing food. -He did eat a little chicken today which is good, but he has been going outside every 10 or 15 minutes to pee! and now he is whining. I took the water up because I am concerned about him drinking TOO much water! I wonder if there is anything I can do or should do to sort of counteract the negative side effects of cortisone? He is a great dane and is 11 years old. Good information. I was 1st time given cortisone tablet’s for my Chihuahua mini foxy,after finding her starting to loose hair from scratching was from getting in contact with another dog who had fleas.although only one was found on her, she was given a main Comfortis tablet that last a month, than 2 week’s worth of quatersone tablet’s,the second week reducing amount to half tablet.Is it still safe for 1st time case, for 2 week’s long to use it. That sort of allergy can also be to food – such as fish. We had a 16yo Pomeranian (F) who was prescribed cortisone tablets for arthritis. She started having strokes a few minutes after taking her tablet each night. We stopped the tablets and the strokes stopped. She died a year later – deaf and blind from the strokes.